There is a new product in the store ladies! I am so happy to be carrying this product!! It makes using unmounted stamps very easy! For those that prefer their stamps absolutely bare, whether for affordability, storage or another reason, this is the product for you! It's by Tsukineko and is called Tack 'N Peel. And here's what it is.... it's a clear sheet that you permanently mount to a any block. I prefer it on a clear block. It keeps your block clear, but makes 1 side SUPER sticky. I have this permanently mounted to a few of my blocks. a 1x1, a 2x2, and a 3x5. This may be a little excessive. But i love it! First of all it's thick for a "sheet". It's about 1/8" thick and it have a little give meaning it gives a little cushion to your unmounted stamps! Dont get me wrong, i LOVE EZ Mount, but this makes unmounted stamps even more affordable and i love more affordable. Now i know PMS doesnt have a lot of super tiny stamps but, have you ever had a small stamp that once mounted on ez mount kind of becomes a pain to stamp with? 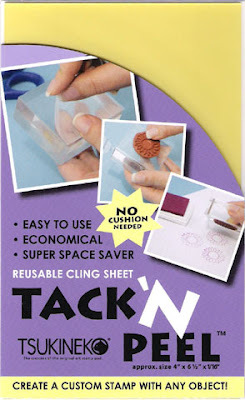 Well tack n peel is great for that because it sticks flat and doesnt "wobble" on ya. I definitely use my 3x5 tack n peel block a lot, but the one that really gets the work is the 1" block i have it on. Wanna know what else you can do? You can stick other objects to your block or wrap it around a brayer and stick string or other objects on your brayer and create some awesome backgrounds! Oh what a cool product Katie! That sounds like a great solution to those little rocking stamps that I am so familiar with. I love how it's adjustable to blocks too so you can customize it. Oooh I love new and innovative stuff! Thanks for finding it for us! How cool Katie!! This sounds awesome! This is the answer to my prayers!!! I have been needing something like this and here it is! Awesome and thanks for getting it! Monday Challenge - Easter basket Time! Another Design Team show-n-tell with SNEAKS! OMG - Did you SEE? Monday Challenge and Preorder news! Welcome the new Design Team! Are ya getting ready for tomorrow! An introduction and a challenge!